Deutsche Bank faces a hefty fine from EU antitrust regulators for rigging benchmark interest rates. The European Union has levied a record antitrust fine of €1.71 billion ($2.3 billion) on six European and U.S. banks and brokers for rigging benchmark interest rates. 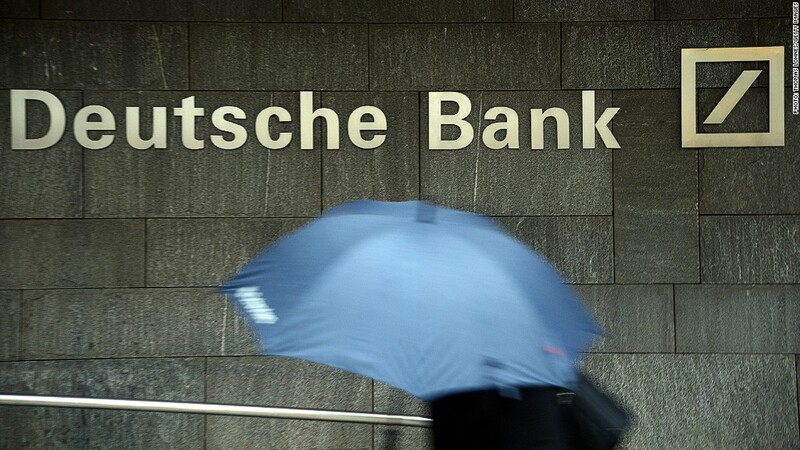 Deutsche Bank (DB) was hit with the single biggest penalty of €725.4 million for participating in illegal cartels to manipulate the Euro Interbank Offered Rate, or Euribor, and London interbank offered rate, or Libor. "What is shocking about the Libor and Euribor scandals is not only the manipulation of benchmarks, which is being tackled by financial regulators worldwide, but also the collusion between banks who are supposed to be competing with each other," said Joaquin Almunia, Europe's top antitrust official. Other banks fined Wednesday were Societe Generale (SCGLY) (€446 million), Royal Bank of Scotland (RBS) (€391 million), JP Morgan (JPM) (€79.9 million) and Citigroup (C) (€70 million). U.K.-based broker RP Martin was fined €247,000 for facilitating one infringement. EU investigators said the Euribor cartel operated for nearly three years between 2005 and 2008, as traders discussed submissions used to calculate the benchmark rate, and compared trading and pricing strategies. They also discovered illegal collusion in the setting of Libor in Japanese yen between 2007 and 2010. "The settlement relates to past practices of individuals which were in gross violation of Deutsche Bank's values and beliefs," said Deutsche co-CEOs Juergen Fitschen and Anshu Jain in a statement. The bank said the fine was already largely covered by existing provisions for litigation costs. UBS (UBS) and Barclays (BCS), who have already been fined by regulators in the U.K. and U.S. for Libor rigging, were spared further punishment because they cooperated with the European Commission investigation. They dodged new fines of €2.5 billion and €690 million respectively. The scandal broke in the middle of 2012 when Barclays admitted trying to manipulate Libor, which together with related rates is used to price trillions of dollars of financial products around the world. Wednesday's announcement takes the global total of Libor-related penalties to almost $6 billion. A handful of traders have been charged with criminal offenses. The EU fine is the latest blow to an industry trying to rebuild its reputation and finances in the wake of a series of legal battles over foreclosure abuses, misleading clients over mortgages, payment protection insurance and other products. Some of the biggest banks are also facing a global probe into allegations that they manipulated foreign exchange benchmarks to profit at the expense of clients. And the Libor story is not over yet. The European Commission is still going after HSBC (HSBC), Credit Agricole (CRARY) and JP Morgan on related charges, and broker ICAP, who opted out of the settlement on yen Libor. "We intend to defend ourselves vigorously," an HSBC spokesman said. More legal action is likely to follow. U.S. government-backed Fannie Mae filed a lawsuit in October against nine banks arguing it lost money on mortgages and interest rate swaps when Libor rates were set artificially low. U.S. law firms are also leading civil actions on behalf of investors who claim they lost out due to the market manipulation. The previous record for a European antitrust fine was 1.47 billion euros, imposed a year ago by the European Commission on six companies who fixed the markets for television and computer screen tubes for a decade. -- CNNMoney's Virginia Harrison contributed to this article.